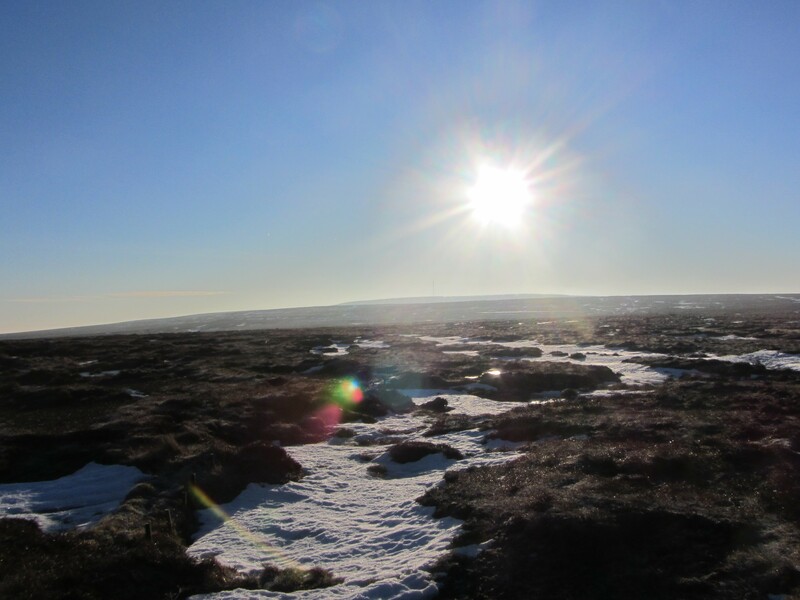 This morning as a change from guiding walks, I went out onto Wessenden Moor with Megan and Bryan from the Moors for the Future Partnership to look at some of their forthcoming work. The aim of their project is to restore the moorland to its former natural beauty by re-vegetating large bare areas of peat. This will provide many benefits, including stopping huge amounts of carbon dioxide from being released into the atmosphere as the peat erodes, and improving the quality of the water that runs into Yorkshire Water’s reservoirs. Peat erodes much more quickly when it dries out, so in addition to re-seeding the area, Megan explained to me that she will be identifying suitable points in the peat gullies to be blocked off. This will stop rain from running off the moor so quickly, retaining the water in the peat. There was too much snow on the ground to enable any work to be done this morning, but lots to do before the start of the nesting season when work will be halted so that ground nesting birds aren’t disturbed. The recent warm, dry weather has been great for walking, but is not so good for the delicate ecosystems of our high moorlands. 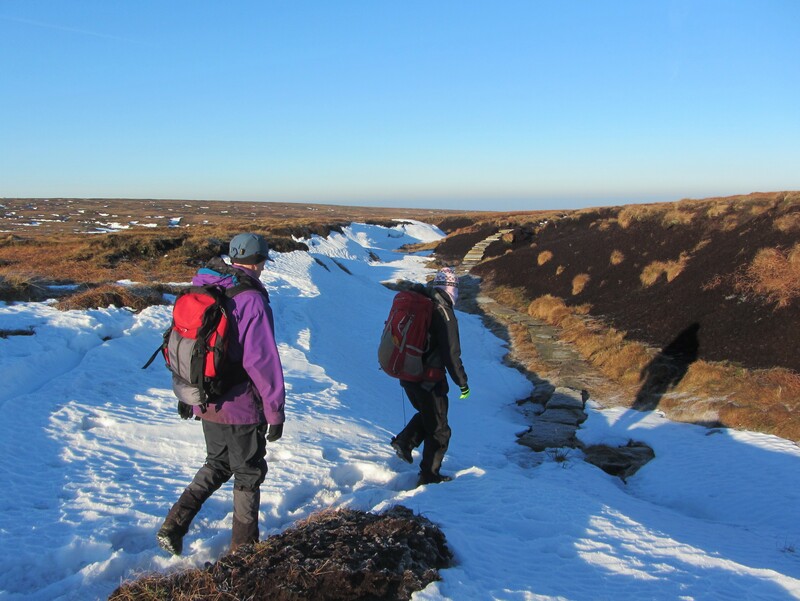 Peat bogs on high moorland areas such as Kinder Scout and Bleaklow are becoming really dry. 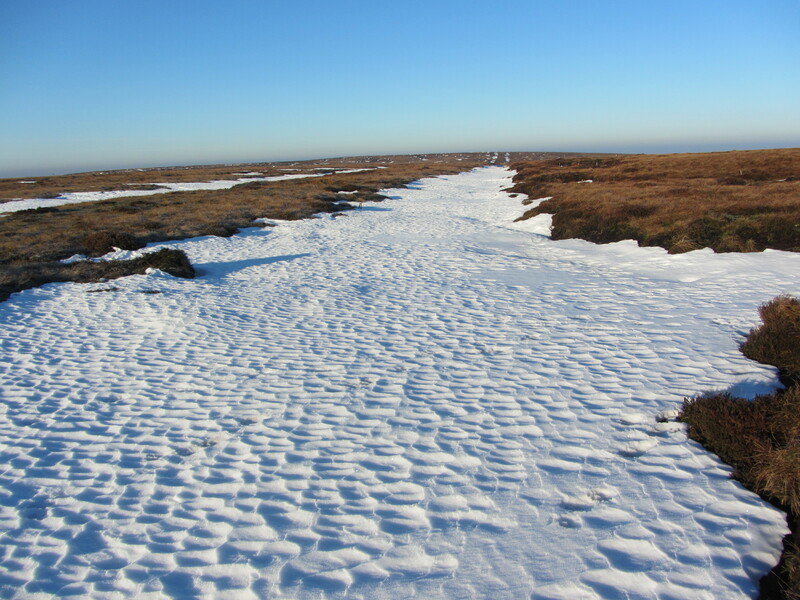 Areas of peat are more prone to erosion when they dried out, releasing carbon dioxide into the atmosphere and resulting in a reduction in vegetation. There is also the increased risk of fire. A lot of work has been done in recent years by organisations such as the Moors for the Future Partnership in blocking gullies and restoring vegetation in an effort to raise the water table, but even this has not been enough to keep the peat bogs wet this year. When visiting these beautiful moors, this makes it even more important than ever that we minimise our impact on the environment by choosing our routes carefully to avoid causing further erosion, and by taking every precaution possible to avoid the starting of fires.